Icebergs and sheep! A strange combination even for New Zealand, renowned for its woolly quadrupeds. This footage results from two rather unusual events. 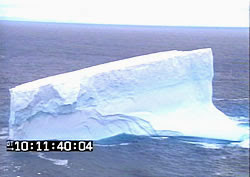 In November 2006, icebergs were sighted 60 kilometres off the Dunedin coast, on the eastern side of New Zealand. This was a rare enough event in itself. It was thought that the parent of these icebergs had broken off the Ronne Ice Shelf in Antarctica six years previously and was disintegrating as it was carried by ocean currents far from home. Although visible from the hills around Dunedin to the naked eye, binoculars were better. But NHNZ staff decided to take to the air for an even better look. And some stunning shots resulted. Shrek, a merino sheep who shot to "stardom" nearly three years earlier, celebrated his tenth birthday with another blade shearing in 2007 on an iceberg 90 kilometres off the Dunedin coast. Shrek first lost his fleece for charity in 2004, amidst huge media attention. He had evaded detection in the Central Otago high country for six years and when shorn, produced a fleece weighing an amazing 25 kilograms. 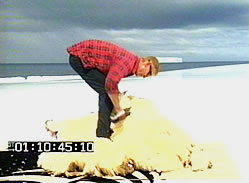 The shearing on the iceberg was no less dramatic, though the drama was prompted more by a huge chunk breaking off the iceberg just as shearing got under way. Looking for footage of a sheep in a helicopter? HD Footage of the icebergs, and Shrek shearing, are available from NHNZ Moving Images. Contact Jamie or Olly on library@nhnz.tv. Forty percent of the net of sales of the Shrek footage goes to "Cure Kids". "Cure Kids" is an organisation established over 30 years ago to address the lack of research into life-threatening childhood illnesses in New Zealand. Check out other interesting, intriguing and arresting images from the NHNZ stockshot library.